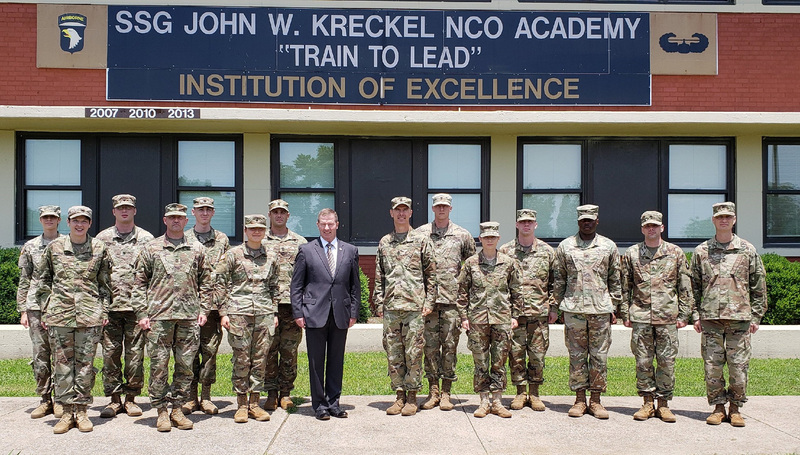 I had the opportunity to visit both Fort Bragg, N.C., and Fort Campbell, Ky., this past month to focus on our Army’s emerging leaders and young professionals. To start, Fort Bragg is one of those special Army installations where everyone in uniform seems to rotate through the installation on an assignment at some point in their career. Retired Sgt. Maj, of the Army Ken Preston, AUSA vice president for noncommissioned officer and soldier programs, center, stands with students attending the Staff Sgt. John W. Kreckel NCO Academy at Fort Campbell, Ky.
With great affection, for those who spend a large part of their career at Fort Bragg, they often refer to the post as the “center of the universe,” while others will argue for their “great place” to live and grow as a soldier. This visit to Fort Bragg allowed me to focus on a very special group of young people, referred to nationally as young professionals. Many communities across the country, chambers of commerce, merging and growing occupational career fields and businesses are now focusing on growing their talent pools with the next generation of leaders. As communities age and businesses come and go, the life-blood for keeping cities and towns vibrant and growing into the future is their ability to attract and retain young professionals. Young professionals are generally described as those 21 to 35 years old, with some references dipping to age 20 and stretching to 40 years. Young professionals can be soldiers, veterans, spouses or civilians in the community looking for likeminded professionals to associate with as a way to learn and grow. The Army needs young professionals and the service must continue to attract our best and brightest young people to fill our ranks, and at some point, retain the very best emerging leaders and young professionals to become our future senior leadership. Looking at the demographics of the Army, approximately 84 percent of the 1 million soldiers in uniform across the Regular Army, Army National Guard and the Army Reserve are enlisted volunteers, while the remaining 16 percent are commissioned officers and warrant officers. Focusing on the heart of the enlisted force we find approximately 30 percent of the enlisted force resides at the rank of specialist, 20 percent are sergeants and 16.8 percent are staff sergeants. Collectively, more than 65 percent of the enlisted force is found at these three ranks. This 65 percent contains many of the Army’s emerging leaders and young professionals, specialists aspiring to become sergeants, sergeants to become staff sergeants and staff sergeants looking to become senior NCOs. Retired Command Sgt. Maj. Andrew McFowler, chapter president of the Braxton Bragg Chapter, and I were products of a young professional association during our days in the Army as young NCOs. These were the days of right-arm nights, NCO and “stable your mount” calls at the end of a tough week when we were back in garrison. These were the after-work-hour social venues that provided us with the opportunity to interact with senior leaders and peers, to ask questions in a relaxed environment and gain the insightful wisdom of many who would serve as mentors for a group of aspiring young leaders. Over the years, society norms have changed and the de-glamorization of alcohol coupled with the busy operational tempo of preparing to deploy, deploying and redeploying has created a void in what emerging leaders and young professionals need and want. Hosted on a Wednesday evening by the AUSA Braxton Bragg Chapter and sponsored by MyComputerCareer.edu, the young professional venue was the result of the effort of Army veteran Joseph King and Joseph Voboril who serves as the chapter’s vice president for young professionals. Voboril and King focus their efforts on putting together an event designed to bring aspiring leaders looking for “golden nuggets” together with leading thought leaders in politics, business, and media in an informal after-work setting like this one each quarter. Thanks to some sponsorship from the local Embassy Suites to donate a meeting room with tables and chairs, a variety of hors d’oeuvre and drink selections from MyComputerCareer.edu, the evening event was scheduled from 7:30 to 9:30 p.m. These two hours were filled with great questions from young NCOs and officers currently serving and looking for those professional development secrets to make themselves better soldiers and leaders. There were also those aspiring young professionals preparing to transition from the Army back into the civilian sector and a few veterans who had already transitioned and are looking for career guidance to help in their transition and to find the “right” occupation and opportunities for the next chapter in their lives. “I am personally interested in talking points of preparing for the transition out of the service when the time comes, how to use networking events to our advantage, the advantages of community involvement, these are things I wish I took advantage of when I was in [the Army] and transitioning out,” said King. While the evening event ended at 9:30 p.m., much of the group remained and continued to talk and ask questions, seeking insights, wisdom and knowledge from the “gray beards” in attendance. wisdom and knowledge of dozens of officers and NCOs who influenced and developed these senior leaders over many years in uniform and in their post-Army careers working in the civilian sector. These emerging leaders and young professionals tapped into an ocean of hundreds of years of leadership, professional development, educational and mentoring experiences in a single evening venue. My visit to Tennessee and Kentucky was sponsored by the AUSA Fort Campbell Chapter. William (Bill) Harpel, chapter president and civilian aide to the secretary of the Army (CASA), and the very talented and engaged Allisha Lee, chapter vice president for emerging leaders and young professionals who also serves as the Young Professional Subject Matter Expert for 2nd Region and works as the Campus Director for Hopkinsville Community College, sponsored my visit. 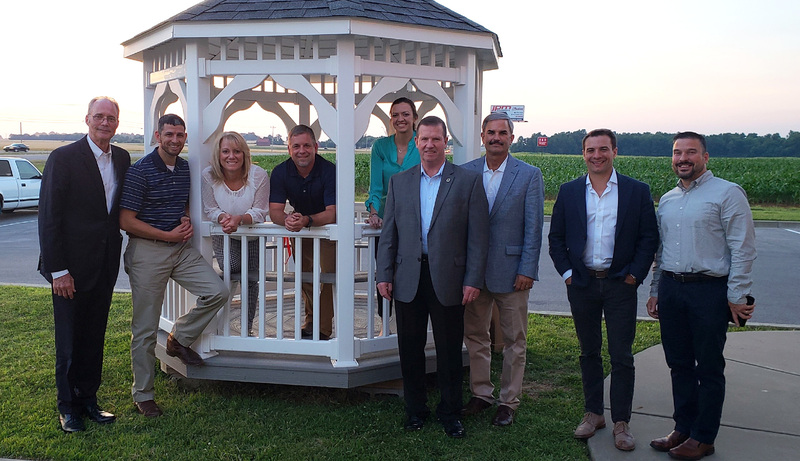 Preston, fourth from right, with the leadership of the AUSA Fort Campbell Chapter, said the chapter created opportunities and events to coach and mentor emerging leaders and young professionals. Lee and I visited the NCO Academy where we had the opportunity to have lunch with a group of young specialists, emerging leaders who expect to be promoted in the weeks ahead following their successful graduation and return to their home station unit. Throughout the lunch period we talked about taking charge for the first time, what to look for when selecting mentors, dealing with soldiers who challenge your authority and how to build a loyal and disciplined team. We also talked about the importance of leading by example and investing in your people through education opportunities and the returned value of educated soldiers for their units. Following lunch, I had the opportunity to congratulate 84 college graduates on their completion of either an associates, bachelor, graduate or doctoral degree from a variety of colleges, universities and schools. I encouraged those who have an associate degree to continue their pursuit of a bachelor degree and if they have an undergraduate degree, keep going to attain that graduate level education. To put things in perspective and understand where one is in their life’s journey, this perspective opens the doors of imagination for improving and creating opportunities for success in the future. Life can be compared to an endless hallway with many doors on the left and right side of the hall as you move forward. Some of these doors lead to connecting hallways with hundreds of more doors. Some doors open into rooms of opportunity while others lead to stairways to connecting floors representing new chapters and phases in your life. But not all the doors are open to you. Some doors remain locked forever. The keys to open some of these doors are the educational goals you seek and attain. But still other doors are only opened by job and life experiences, while many other doors are discretely guarded and will only open based on a networking connection. Young professionals and emerging leaders want to learn about leadership skills development, and professional development within their chosen profession, like the profession of arms and the art of being a good leader. Young professionals want to attain their educational goals through college, credentialing, licensing and certifications. Young professionals and emerging leaders want mentorship and, in most cases, they need and want multiple mentors for different aspects of their lives. Young professionals and emerging leaders want networking opportunities and a fellowship that aligns with their ideals, goals, values and beliefs. Volunteering within the community, to become part of something greater than yourself is a key component to fellowship, networking, learning and broadening individual experiences. Young professionals and emerging leaders who balance full-time military and civilian careers, families and find the time to volunteer to support the local community and great organizations with a worthy cause – like your local AUSA chapter – will find the payback for their efforts is 10-fold as you will stand out among your peers. Volunteering to attend and participate in professional development discussions with other young professionals and emerging leaders is another opportunity to demonstrate you are a “mover and shaker” who seeks opportunities for self-development and life-long-learning. In each of these “wants and expectations” above, a professional association like the Association of the United States Army, aligned with like-minded leaders and professionals, provides the growth opportunity young professionals and emerging leaders need and want. For these two great AUSA chapters, keep going, keep creating these opportunities to coach and mentor our future leaders. Additionally, be consistent and regular in planning your young professional and emerging leader events so you can over time create an increased following. If you build it, they will come; a worthwhile and beneficial program that gives these emerging leaders and young professionals what they need and want will sell itself, and spread to more followers who will come with friends. Create volunteer opportunities within the community and the chapter to get the young professionals and emerging leaders out of the barracks and housing areas to have fun and learn. The three co-authors on this article are all amazing and great role models for other emerging leaders and young professionals looking for the secrets to unlock those doors to a bigger and brighter future.